Triple Mint Candela Classic 10Ideally located in of one of Rosario Candela's premier white-glove cooperatives is this stunning and meticulously renovated 10-room residence. No detail was spared by renowned architect Alan Wanzenberg in this meticulous renovation, from the restored original oak herringbone floors, paneled doors & hardware to the thoughtfully redesigned layout. Blending the original details with modern day living, the apartment enjoys a multi-zoned central air-conditioning/humidification system, thermally insulated UV treated windows, Crestron system for black out/solar shades & Lutron system for lighting, and much more.A private marble landing opens into an elegant 23' x 10' gallery, which has generous wall space for art, a coat closet and natural light pouring in from the main entertainment rooms. 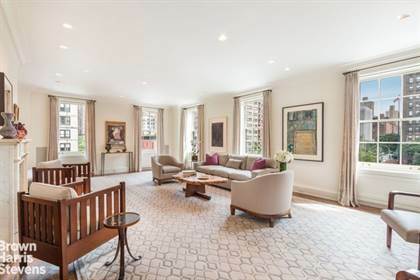 Flowing off of the gallery is the Southeast-facing corner living room; with original wood-burning fireplace and five windows, this room has beautiful light all day long and spectacular unobstructed views of Park Avenue all the way south to Midtown. Also off the gallery is the East-facing formal dining room, which can easily accommodate seating for 16. Conveniently located next to the dining room and off the gallery is the pantry and a half bathroom. The thoughtfully designed pantry has ample storage, vented Miele washer/dryer, and 264 bottle capacity Subzero double wine refrigerators. Opening off the pantry is the stunning windowed chef's eat-in kitchen, complete with custom wall paneling and cabinetry, Calacatta Gold marble countertops, and oak wide-board flooring. There are Wolf double ovens, a 6-burner Wolf gas stove that vents out, 48" Subzero Refrigerator, Franke double sink, and Bosch Dishwasher. Completing the public portion of the apartment is the Mahogany paneled library also located off the gallery. The South-facing library can easily function as an additional bedroom should one desire.The private wing of the apartment has a master suite and three additional bedrooms. The first bedroom faces south and has generous closet space and a beautiful windowed marble bathroom en-suite that could become a 'Jack and Jill' bathroom with the library should one need to do so. Just past this bedroom is the tranquil master suite. Also facing South, this room has two large walk-in closets, room for a sitting area and spacious windowed marble bathroom with steam shower. There are two more bedrooms, each with a closet that share a private hall with full windowed marble bathroom.The apartment has an alarm system, Museum quality Nulux art lighting, a Sound System with Bowers and Wilkins and Linn built in speakers, and Waterworks bath fixtures and bath accessories and kitchen fixtures throughout. There is a storage unit with custom shelving built-in located in the basement.